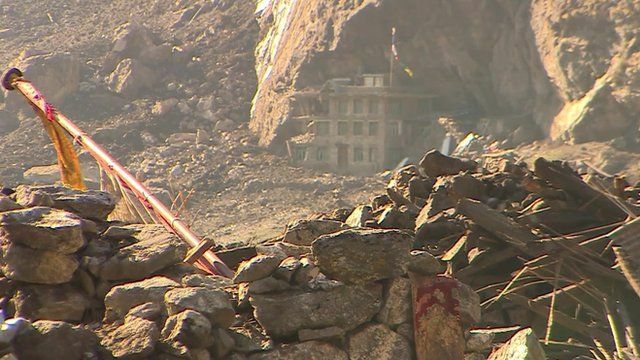 Nepal trekking village Langtang wiped out Jump to media player South Asia Correspondent Justin Rowlatt is the first reporter to visit what is thought to be the worst-affected village of Langtang. Nepal: More survivors 'unlikely' Jump to media player It has been a week since the devastating earthquake in Nepal and officials say it is now very unlikely they will find any more survivors. Trade concerns in Nepal Jump to media player Nepal has a widening trade gap with neighbouring India, so should more be done to try and redress the balance? Drone films Nepal quake destruction Jump to media player Aerial footage filmed by a drone shows the devastation caused in the Sindhupalchok district, near the epicentre of the earthquake in Nepal. Emergency workers in Nepal continue to face challenges after the devastating earthquake. Their priority is to reach the country's remote, mountainous villages, feared to have been wiped off the map. South Asia Correspondent Justin Rowlatt is the first reporter to visit what is thought to be the worst-affected village, Langtang.